Considered the national instrument of Argentina, the guitar is used throughout the country in wide variety of styles. Yet, in the United States we rarely have the opportunity to hear these styles of music apart from the tango. 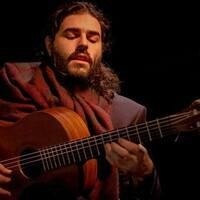 In this lecture-recital, Patricio Crom will guide us through Argentine guitar history and a variety of styles from throughout the nation. From tango to chacarera, classical to zamba, the wealth of guitar music from Argentina speaks for itself. Born in Buenos Aires, Patricio Crom is an arranger, composer, and guitarist of Argentine music. He studied tango guitar at the Academia Nacional del Tango with maestro Aníbal Arias. Patricio has recorded several albums, as well as performed throughout South America, Europe, and Asia. In 2019, Patricio will release his third album with singer Juan Villareal recorded in Valencia Spain titled En la luna de Valencia. In addition to his musical activities, he is an accomplished puppeteer, a collector of antique Argentine guitars, and is preparing a documentary film on tango guitar.